It’s winter and cold is inevitable. 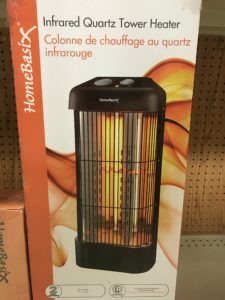 Keep your home warm for the winter with our HomeBasix Infrared Quartz Tower Heater now in-stock at Argyle Feed Store. This heater is an infrared quartz heater that works by heating objects in a room rather than the air around the heater. This allows heating the room much faster and warmer. Below are the features of this unit. Keep warm this winter with the HomeBasix Infrared Quartz Tower Heater. This entry was posted on Thursday, December 21st, 2017 at 4:42 pm	and is filed under News & Updates. You can follow any responses to this entry through the RSS 2.0 feed. Both comments and pings are currently closed.